You Can Get Rs.1250 Directly in Your Lybrate Account by Applying this code. Lybrate Cash can be used as 20% on your next order. 2. Login & Apply the Lybrate Code & Done. 3. You will get Rs.1250 Lybrate Cash. You can use on next transaction at a limit of 20% of order value. Get Sensodyne Deep Clean Sample for just Rs.1 – Hi Friends, There is a New Freebie from Lybrate Where you won’t need to pay any extra amount. Just pay Rs.1 & Get Sensodyne Deep Clean Paste. 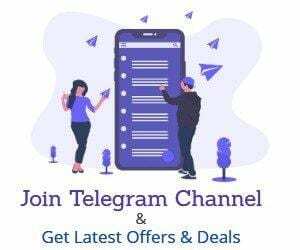 This Offer is valid for first 20000 users so grab it Fast. 2. Now Enter Your Name, Email and Shipping Address. 3. Verify Your Mobile Number Using OTP. 4. Proceed to Pay Shipping Rs.1. Pay Shipping Using Paytm Wallet or Debit card Pay Using Phonepe. Get Mother’s Horlicks gm Sample Free – Lybrate’s Free Products Deals are back. Now You can Get Mother’s Horlicks 25gm pack at Just Rs.10(Shipping) Which you will Get as cashback in Lybrate cash. You can use it for your next order. So Place the order Now. Mother’s Horlicks with 25 vital nutrients is nutritionally designed for pregnant and lactating women. Mother’s Horlicks contains micronutrients known to support healthy birth weight of the baby, DHA and choline for brain development and calories to help meet the increased demands of energy in pregnancy. Now, it comes with No Added Sugar. Mother’s Horlicks is also high in protein and helps provide 100% of daily requirement of Vitamin B2, B12 and C for pregnancy; Vitamin B2, Iron and Folic Acid for lactation. 4. Proceed to Pay Shipping Rs.10. Pay Shipping Using Paytm Wallet or Debit card Pay Using Phonepe. 6.Rs.10 will be added Cashback. 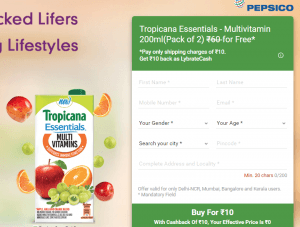 Tropicana Essentials – Multivitamin 200ml(Pack of 2) ₹60 for Free* – Another Lybrate’s Free Products Loot is here for Selected Cities Lybrate is offering Tropicana Essentials – Multivitamin 200ml(Pack of 2) ₹60 for Free*. You have to Pay Rs.20 from which you will Get Rs.10 back as Lybrate Cash. 2. Now Enter Your Name, Email and Shipping Address. Your Age Should be Between 14-35 to Get This Free Product & City are listed on Page. Nestlé CEREGROW Free – Lybrate also Offering Nestle Ceregrow for Free. You can buy This Freebie also with Your Other Lybrate Freebies.This pack is for 2-5 Yrs old Childs.A nutrient dense cereal for 2-5 year old, packed with 15 vitamins & minerals assuring nutrition with every bowl for your growing kid. You can Buy This Pack for Free & You have to pay just Rs.15 that will be added as lybrate cash to your wallet in next 14 hours. You can Use lybrate Cash for Placing Other Orders. 4. Proceed to Pay Shipping Rs.15. Pay Shipping Using Paytm Wallet or Debit card Pay Using Phonepe. 6.Rs.15 will be added Cashback that you can use on next order. Organic Harvest Acne Control – Lybrate is again back with Organic Harvest Acne Control Face wash at just Rs.4 effectively. The Facewash is rich in Natural herbs & Deeply purify your skin. You can Order this Product at Just Rs.120 & You will get 80% Lybrate Cash. That you can use later to purchase another sample. Additionally, You will get Rs.20 Phonepe Cashback. 4. Proceed to Pay Shipping Rs.120. Pay Shipping Using Paytm Wallet or Debit card Pay Using Phonepe. 6.Rs.96 will be added Cashback. The validity of your LybrateCash earned from purchasing this product is 180 days from the date of the LybrateCash against this order being credited to your account. Lybrate was stealing my money and did not send their product.